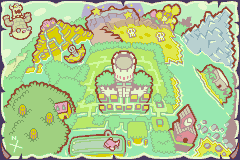 Little Fungitown is an immigrant Toad community built on giant Mushrooms in Mario & Luigi: Superstar Saga. The place is located at the far end of Teehee Valley, and the Mario Bros. have to cross Teehee Valley to get here. 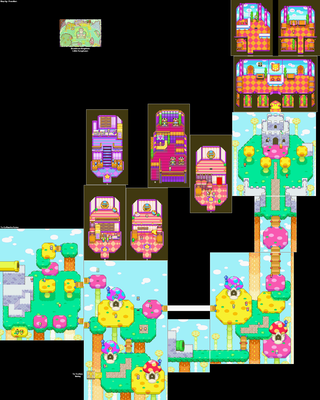 This town is the first town in the known Mario places to have an actual hospital, in the Little Fungitown Embassy (the second one is a hospital operated by Dr. Toadley in Mario & Luigi: Bowser's Inside Story). Psycho Kamek (Dr. Toadley in Mario & Luigi: Superstar Saga + Bowser's Minions) lives here, and manages to hypnotize Luigi into believing he was Mario. Little Fungitown also has an arcade and the various shops and residences resemble Toad Houses. Hidden away in the southern part of town, Warp Pipe #7 (#9 in the remake) can be used to traverse to Little Fungitown without having to cross the treacherous Teehee Valley. Mario beat the high score in the Star 'Stache Smash minigame and won an Invincishroom (revealed in Minion Quest: The Search for Bowser to actually be a misidentified Poison Mushroom) as a prize, causing him to get Bean Fever here. The future barrel game is here too, which is available after the S.S. Chuckola sinks. Invisible blocks are here containing Hoo Beans. When Luigi gets out of Guffawha Ruins, he comes out of a pipe in a top corner of Little Fungitown. Popple is also eventually sentenced to community service in Little Fungitown. In Minion Quest: The Search for Bowser in Mario & Luigi: Superstar Saga + Bowser's Minions, Little Fungitown is seen in the mission Toad Rescue, where Morton Koopa Jr. and a group of Fire Bros. are found attacking the town. The minions must then battle Morton. Hee Beans can be obtained by playing games at the arcade, and Hoo Beans can be obtained from hidden blocks. Click on an area to open the relevant article. Italian Toadopoli "Toad" with the suffix -poli, meaning "city"
Little Fungitown's music is an arrangement of the overworld theme from Super Mario Bros. Bounce Bros. • Chopper Bros. • Cyclone Bros. • Fire Bros. • Knockback Bros. • Splash Bros. • Swing Bros. • Thunder Bros.
* Exclusive to Mario & Luigi: Superstar Saga. • ** Exclusive to Mario & Luigi: Superstar Saga + Bowser's Minions. † Enemy, boss, or stat exclusive to the main game. • †† Enemy, boss, or stat exclusive to Minion Quest: The Search for Bowser. • ††† Enemy variants differ in Mario & Luigi: Superstar Saga + Bowser's Minions. This page was last edited on April 24, 2019, at 21:44.